Recommended for: Adult dogs with sensitive stomachs and/or sensitive skin. These ranges are a starting point only because dogs’needs vary.1,2 Adjust the feeding amount to maintain optimal body weight. Ingredients: Recommended for: Adult dogs with sensitive stomachs and/or sensitive skin. 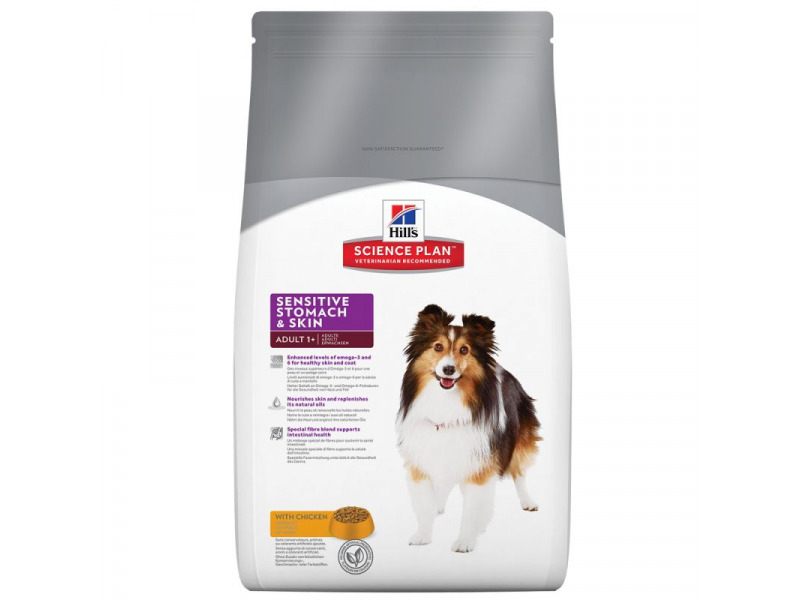 Below are some recent questions we've received regarding Hills Science Plan Adult Sensitive Stomach & Skin Dog Food, including answers from our team. Could you provide details of analytical constituents please, e.g. Protein, Fat etc. I ask because I have an elderly Cocker Spaniel who is prone to Pancreatitis and I keep fat levels in her food low. I also have a young Sprocker with a tendency to tummy upsets and it would be so good to be able to give them the same food. Protein 25%, Fat 15%, Carbohydrate (NFE) 52.90%, Fibre (crude) 1.70%, Moisture -, Calcium 0.71%, Phosphorus 0.61%, Sodium 0.36%, Potassium 0.71%, Magnesium 0.08%, Omega-3 fatty acids 0.59%, Omega-6 fatty acids 3.41%, Vitamin A 10489IU/kg, Vitamin D 522IU/kg, Vitamin E 652mg/kg, Vitamin C 76mg/kg, Beta-carotene 1.6mg/kg. Your dog may benefit from a more natural feed like Natures Menu or even a raw diet as these are 100% natural. It would be best to check with the vet first though if your dog has a condition. With regards to eating their faeces, a supplement like VETIQ Stool Repel will help to deter them from eating it.